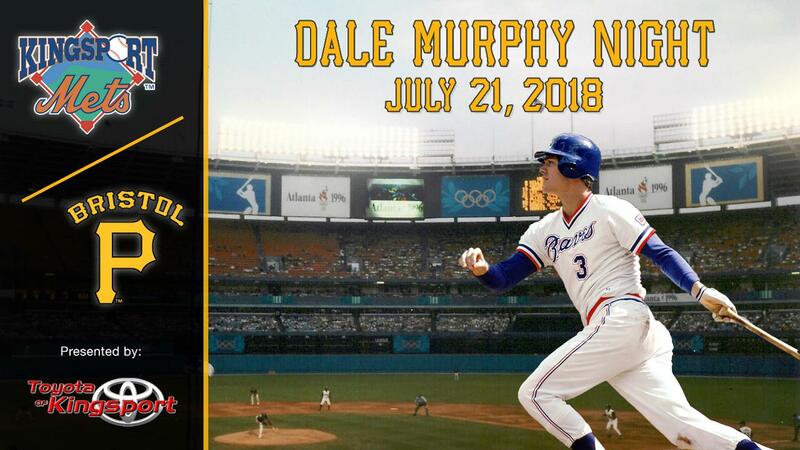 Toyota of Kingsport, Bristol Baseball, Inc. and The Bristol Pirates would like to invite you to come out and attend DALE MURPHY NIGHT when Your Bristol Pirates host the Kingsport Mets on July 21, 2018. Ticket Pre-Sale for this Event will begin April 28, 2018 at 12pm. Click for more information. Atlanta Brave great Dale Murphy, who began his 20-year career in professional baseball in the Tri-Cities in 1974, will return to the Appalachian League on July 21 when the Bristol Pirates host the Kingsport Mets. Drafted in the first round of the June 1974 amateur draft, Murphy made his professional debut as a catcher later that month with the Kingsport Braves. He hit five home runs, driving in 31 runs, that summer, and quickly progressed through the minor leagues, earning a late-season call-up to Atlanta in 1976, where he was moved to the outfield. A seven-time All Star, and the youngest winner of back-to-back National League MVP trophies in 1982 and 1983, Murphy starred with the Atlanta Braves from 1976 until 1990, and finished his career with the Philadelphia Phillies and the Colorado Rockies. During his 1983 MVP season, he became the only player to compile a .300 or better batting average, 30 or more home runs, 120 or more runs batted in, score 130 or more runs, draw 90 or more bases on balls, and steal 30 or more bases in one season. Winner of five consecutive Gold Gloves while manning center field for the Braves from 1982 to 1986, Murphy led the National League in home runs in 1984 and 1985, leading the league in runs scored and in walks in the latter year, and in slugging the former year. During both of his MVP-winning seasons, he led the league in runs batted in, and also led the league in slugging and on-base percentage in 1983. In 1982, he also led the Braves to a division championship. Also, from 1982 through 1985, he played in every one of the Braves' games. Murphy collected four Silver Slugger awards during his 18 big league seasons, collecting more than 2000 base hits, including 398 home runs, scoring almost 1200 runs, and knocking in 1266 runs during his career. During the decade spanning 1981-1990, he led the major leagues in home runs and RBIs. He also led the National League in games, at bats, runs, hits, extra base hits, runs created, total bases, and plate appearances during that same period of time. Following his retirement from baseball, Murphy's number 3 was retired by the Braves. Off the field, Murphy generously gave of his time and was named by Sports Illustrated as one of the "Sportsmen and Sportswomen of the Year," representing baseball as the athlete "Who Cares the Most" and was honored as such by President Ronald Reagan at the White House. Murphy's visit to Bristol is sponsored by Toyota of Kingsport.